YIMBY has reported on 200 Amsterdam Avenue extensively, revealing renderings back in 2016 and then covering the start of excavation in October. Since then, Extell’s 50 West 66th Street has upstaged it as the soon-to-be tallest on the Upper West Side, but SJP Properties’ 55-story and 669-foot-tall contribution to the skyline will still be extremely impressive in its own right. Today, we have a new set of renderings that give a clearer picture of the actual skyscraper, and a close-up of its crown. Elkus Manfredi is the tower’s design architect, and CetraRuddy will be helming the interiors. 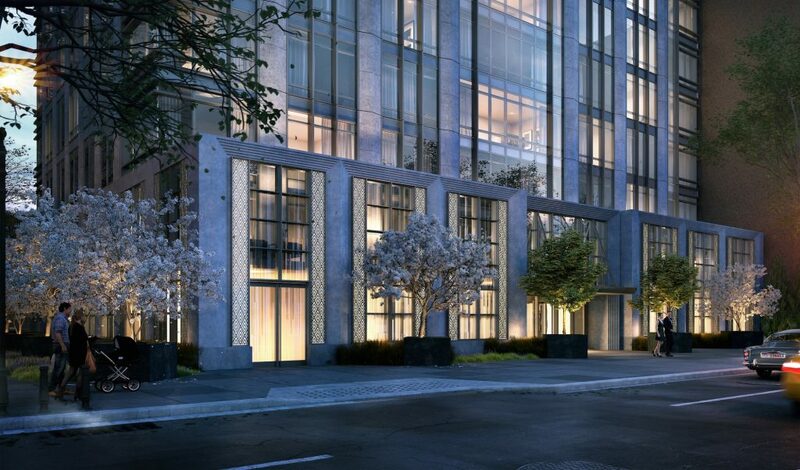 The exterior will feature a glazed aluminum curtainwall, profiled metal panels, and composite masonry. Windows on the north and south elevations will be framed in vertical masonry piers and horizontal metal spandrels, contrasting against continuous alternating ribbons of glass and masonry on the other two sides. At the base, the tower will employ light gray limestone for the facade of its first two floors, with black granite at the base and stainless steel accents matching the metallic look of the upper floors. Two-story windows will be framed by backlit grills. The net effect is something contemporary that will nevertheless do a far better job of emulating Art Deco and traditional architecture than much of the surrounding neighborhood that is already built. While Fordham University’s gradual infill and Riverside Center are welcome improvements to the south and southwest, many of the surrounding blocks are composed of tower-in-the-park style housing, either public or private, and is extremely urbanely inhospitable. While 200 Amsterdam Avenue’s relative proximity to Broadway means it doesn’t suffer the aesthetic indignities that plague pedestrians in the blocks to the southwest, its rise is still a signal that the area can and should support dense residential developments that are actually attractive. With the 1, 2, and 3 trains just a few blocks away at 72nd Street, and the B and C trains just a few blocks further, the neighborhood’s transit accessibility and obvious potential is obvious. With projects like 50 West 66th Street joining 200 Amsterdam Avenue and the host of other legitimately habitable residential towers on the rise in the vicinity, rethinking the general zoning of the no-man’s-lands in the blocks to the west of Lincoln Center would help activate a part of the Upper West Side that is completely cut-off from the rest of the neighborhood. Unfortunately, it has remained squashed under Gale Brewer, who may be the defacto leader of the most cacophonous chorus of NIMBYs Manhattan has ever seen. Besides leading useless protests against the free-market down on 57th Street, the demagogue has recently taken to the City Council in a bid to propagate additional reams of restrictive red tape. In any case, in the midst of one of the most regressive political fiefdoms of New York City, it is refreshing to see developments that manage to beat the heavily-stacked odds against their rise. 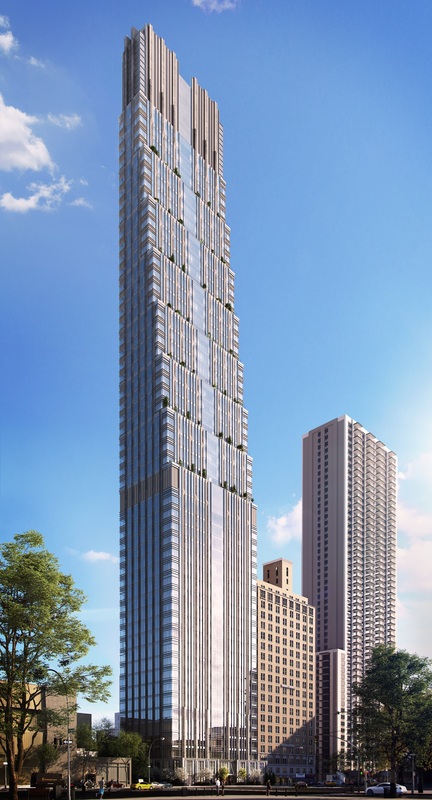 200 Amsterdam Avenue will have 112 condominiums spanning 283,000 square feet of space, and completion is tentatively expected by 2020. 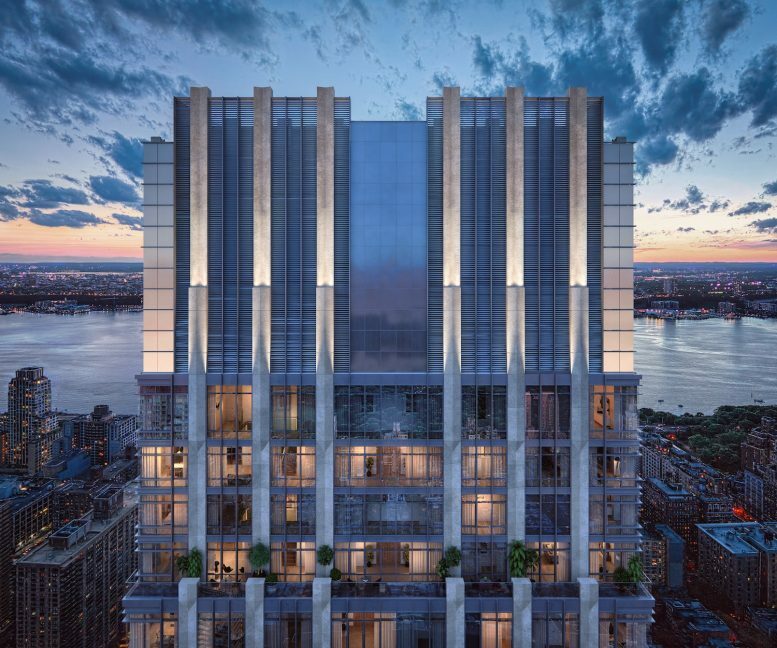 5 Comments on "Renderings Reveal Crown of 55-Story Art Deco-Inspired 200 Amsterdam Avenue, Upper West Side"
Please pardon me for using your space: From its head to toe, so stick with me on sloped. The 1,2,3 and trains are overburdened already. There are no supermarkets and restaurants in the neighborhood. This will severely tax public transportation and services in the neighborhood and cast a big shadow. it takes new buildings to spur the revitalization of public transportation, so be it.